Lord Robert Baden-Powell (1857-1941), the founder of the Scout Movement, disguised as an Indian Chief during his visit to Canada in Canada. Photo: Scout.org. The movement was initially open only to British children. However, after the British victory in the First World War [1914–1918], but paradoxically having taken the lives of multiple Indian Nationals, British rulers accepted the enrollment of Indian children for membership into the domestic movement and international brotherhood. This decision created the establishment of the Scout Headquarters in central cities all over the Indian Sub-continent. In 1926, a Scout Headquarter was established in Karachi as well. There were cultural challenges in starting the Scout Movement in the Indian sub-continent, particularly in Muslim areas, where young boys were not expected to be seen in half-pants, part of the Boy Scouts uniform. The shalwar was the common dress worn by men in the sub-continent at that time. It was also difficult to impress upon people about the idea and concept of ’scouting ‘ in these communities. A portrait of Prince Aly S. Khan. He was the first Chief Scout of the Ismailis from 1931-1960. Photo: Khizar Hayat Collection. The Ismaili Community in Karachi was quite small at the time, yet amidst the entire Muslim community, the Ismailis of Karachi were in the forefront of establishing Scouting Troops. In 1927, two units were established in Karachi; these were the Prince Aly S. Khan Kharadar Scout Troop, (with Hazur Vazir G. Allana as Scout Master), Prince Aly S. Khan Garden Scout Troop, (Alijah Hyderali Kassam as Scout Master) and, in 1928, the third troop, Vazir Rahim Boarding Scout Troop was established. These three troops — the first to receive recognition and patronage of the Ismaili Jamat — functioned independently at this time. In 1930, when Prince Aly S. Khan visited India, he introduced scouting to the sub-continent under the guidance of his father, our beloved 48th Imam, Mawlana Sultan Mahomed Shah. The same organisational structure and system as originally started in South Africa by the world Chief Scout, Lord Baden-Powell was followed. The Ismaili youth enthusiastically responded to the call of their beloved Prince, establishing Scouts and Guide organizations in little time, in principle cities and towns of the sub-continent. These have been flourishing ever since. The following year in 1931, Mawlana Sultan Mahomed Shah appointed Prince Aly S. Khan as the first Ismaili Chief Scout! It was because of his untiring efforts that these troops were registered with Scout Headquarters in 1931. Another Scout Troop was established 1932 known as the Prince Aly S. Khan Lassi Scouts Troop (with Atimadi Alimohd Hashoo as the first Scout Master). Pir Sabzali and Varas Bundeali Kassam started a Bugle Band in Kharadar in 1927 under the Captainship of Varas Husain T. Ramzan. This band subsequently converted into a Pipe Band. Known as “The Aga Khan Band”, it had the distinct honour of being in attendance when Quaid-e-Azam Mohammed Ali Jinnah, founder of Pakistan, was sworn in as the first Chief Scout of Pakistan in 1948. Other Pipe Bands were established including the Prince Aly S. Khan Garden Scout Band in 1932, the Prince Karim Aga Khan Scouts Band in Lassi in 1943, Platinum Jubilee Badakshani Hunza Band in 1954 and H.R.H. the Aga Khan Karimabad Band in 1961. The process of establishing Girls Guides Companies, Blue Bird Flocks and Cub-Packs gained great momentum and reached its peak in 1937 when the Hon. Organizer Mr. Bulchand  formed an association under the name of the Karachi Ismaili Scouts Association. However, the full-fledged association known as H.R.H. the Aga Khan Ismailia Scouts Association was formed in 1939 under the first President, Vazir Rajabali H. Rehamani, who worked with dedication and hard work for more than 20 years. Ismaili scouts around the world salute our beloved late Prince Aly S. Khan for his guidance and supervision, because otherwise under the prevailing circumstances, this movement would not have started in the community. He established a strong organization not only in Karachi but in Africa, Burma, India and the U.K, and membership rose by thousands. A rare portrait of Prince Amyn Mohamed. Photo: Khizar Hayat Collection, Toronto, Canada. Prince Aly Khan passed away on 13th May 1960 in a tragic accident. A loss and a lull was created. In 1965 Mawlana Hazar Imam graced the request as successor of the post, from the Aga Khan Association for Ismaili Scouts, Guides, Band and Orchestras, Karachi. He sent a holy talika to the President of the Ismaili Scouts Association appointing Prince Amyn Mohamed as Ismaili Chief Scout. From that time, the greatest wish of the Ismaili Scouts Association of Pakistan was to organize a Grand Investiture Ceremony of Prince Amyn Mohamed as CHIEF SCOUT OF ISMAILIS. Correspondence was exchanged and a humble request was also made before Mawlana Hazar Imam. 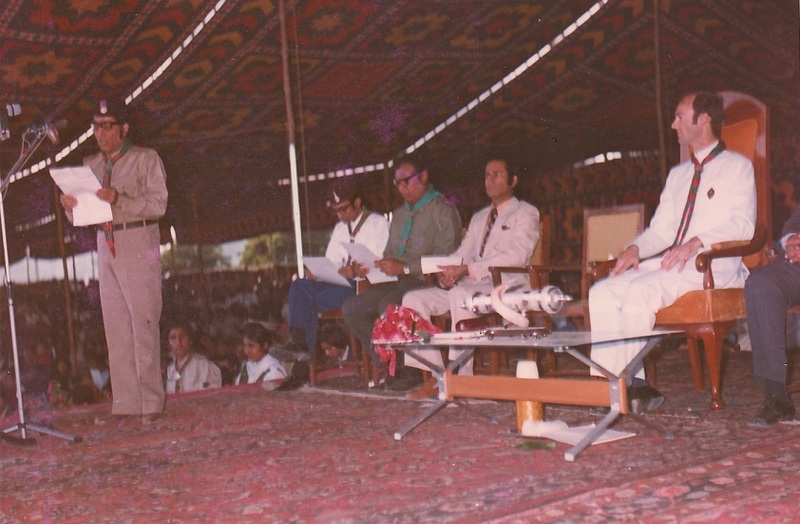 The wish of the Ismaili Scouts was finally fulfilled during Prince Amyn Mohamed’s visit to Pakistan in 1974, which commenced with his arrival in Karachi on November 26th. As part of his thirteen day visit, he had graciously accepted the request to be invested as the Chief Scout of the Ismailis. On December 3rd, a few days before the ceremony, a delegation representing His Royal Highness the Aga Khan Association for Ismaili Scouts, Guides, Bands & Orchestras, Karachi met with the Prince at his residence to discuss the Investiture Ceremony and Rally. At that time I was an Honorary Secretary of the Association and attended the meeting with my colleagues Vazir Sherali Alidina, President, Alijah Ashiqali J. Ladhani Vice, President, Mr. Iqbal Qureshi, Honorary Organizer.. The ceremonial and impressive Investiture Ceremony finally took place a few days later, on December 7th, at the grounds of the Aga Khan III Foundation School. Around 3000 members of the Aga Khan Association for Ismaili Scouts, Guides, Bands and Orchestra and the Association of the Aga Khan All Karachi Volunteers & Ladies Volunteers Corps dressed in full uniform welcomed Prince Amyn Mohamed as their Ismaili Chief Scout. The event was also attended by around ten thousand Jamati members, Ismaili leaders from Pakistan as well as numerous individuals representing national and provincial government and private organizations including the Pakistan and Sindh Boy Scouts and Girls Guides Associations. The Education Minister for Sind, Mr. Pyerali Allana, a high-profile Ismaili, and the Estate Agent of Mawlana Hazar Imam in Pakistan, Vazir Captain Amirali Currium, also witnessed this historical event. Upon his arrival, Prince Amyn Mohamed was greeted with loud cheers and was introduced to all the office bearers, Group Scout Masters, Captains of the Bands, District Commissioner for Ismaili District for Girls Guide and the three Majors of the Volunteers Corps. Prince Amyn Mohamed is pictured greeting Khizar Hayat (author of this article) on arrival at the parade ground. Mr. Hayat was the Honorary Secretary of the Scouting Association, which was responsible for coordinating Prince Amyn’s investiture as the Chief of the Ismaili Scouts. Photo: Khizar Hayat Collection, Toronto, Canada. Vazir Sherali Alidina, President of the Scouting Association, left, was in charge of conducting the investiture ceremony, which began with Prince Amyn Mohamed Aga Khan reciting the Scout Promise with his left hand on the flag of the Ismaili Scouts Association and his right hand raised in half salute. 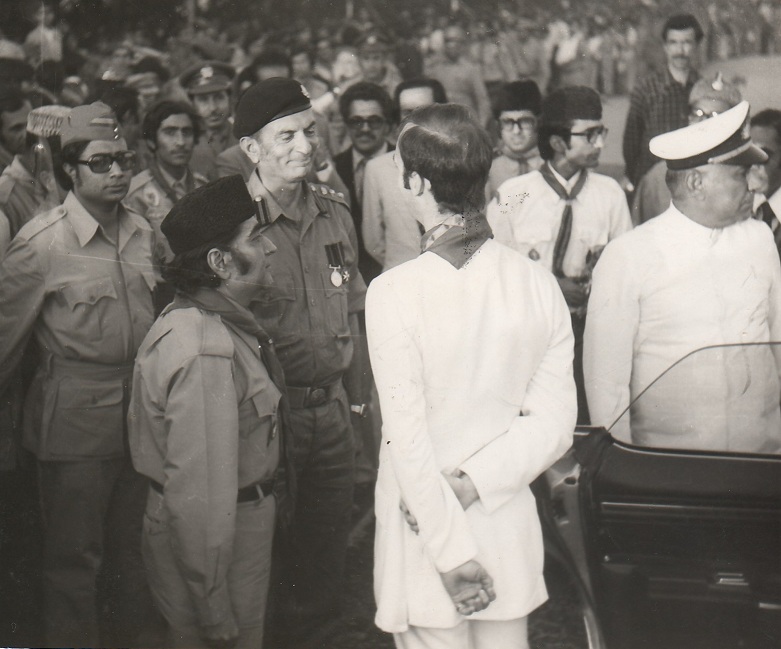 The President then wrapped the Scout Scarf on Prince Amyn Mohamed’s nape, and pinned the scout badge on his left pocket completing the task with a left-handed scout hand shake with the Prince; the Prince now officially became the second Chief Scout of the Ismailis, following his late father, Prince Aly Khan, who was the first Chief Scout of the Ismailis. The dignified ceremony was short and lasted fifteen minutes. Photo: Khizar Hayat Collection, Toronto, Canada. Prince Amyn was then taken in an open car to inspect the Parade, following which he took the salute of the march. More than ninety units of Ismaili Scouts Associations and Ismaili Volunteers Association were marching. Photo: Khizar Hayat Collection, Toronto, Canada. The Prince then returned to the stage where Vazir Sherali Alidina read a welcome address in which he provided a brief overview of the scouting association; see following excerpt. Photo: Khizar Hayat Collection, Toronto, Canada. This Association came into existence in the year 1937 with a view to bring all the Ismaili Scouts; Cubs, Rangers, Guides, Blue Birds and Bands on one platform in order to serve the cause of Scouting and Guiding in our community and our country. At the time of its establishment we had 3 Scout Troops, 3 Girl Guide Companies, 3 Blue Bird Flocks and 2 Bands with a total strength of 350. We have the pleasure to mention that we have now 11 Rover Crews, 17 Scout Troops, 15 Cub Packs, 6 Ranger Companies, 16 Girl Guide Companies 16 Blue Bird Flocks, 5 Bands, and 4 Orchestras, with a total strength of 3,525 members — Excerpt from remarks by Vazir Sherali Alidina, President of the Ismaili Scouts Association at the Investiture Ceremony. Prince Amyn Mohamed then addressed the colorful gathering; see following excerpt. Photo: Khizar Hayat Collection, Toronto, Canada. It is for me not only a great happiness, but also a great honour to have been invited to hold the office of Ismaili Chief Scout, and it is with both pride and enthusiasm that I look forward to the duties that will befall me this position. Indeed, the scout movement has forever embodied amongst the noblest of human aspirations amongst the most admirable of the qualities of the human heart – courage with self-sacrifice, independence with service and honour to others, honour with duty and with loyalty and with discipline. And these aspirations, these qualities, are required of the youth of today more than ever, on the one hand, insofar as today’s young men and young women are concerned as individuals, and on the other hand, insofar as it concerns their effective contribution to the peace and progress of their country in years ahead — Remarks made by Prince Amyn Mohamed at the Investiture Ceremony. Prince Amyn Mohamed seen talking with Mr. Iqbal Qureshi before leaving the parade ground. Mr. Qureshi’s services in the scout movement are impressive as noted in the June 1972 issue of “The Tent”. He joined the scouts in 1923 and went on to become the Scout Master of the 14th Karachi Troop in 1932. From 1942 until 1969 he was the SKIPPER of Karachi Sea Scouts. He attended the 8th World Jamboree in 1955 at Niagara-on-the-Lake, in Ontario, Canada, as the Leader of the Pakistani contingent. In 1958, he was appointed by Prince Aly S. Khan as the Honorary Organizer of the Ismailia Scout Association. Photo: Khizar Hayat Collection, Toronto, Canada. I should like to start this letter by offering you my best congratulations, late though, I know them unfortunately to be, for the most excellent fashion in which you organized the Scout Investiture ceremony during recent all too brief visit to Pakistan. I thought the ceremony was first-rate in its order, interest and execution. I was impressed not only by the way you handled a largish crowd, but also by the style of March Past by the various units, as also by the polish of the different numbers in the programme of entertainment. Would you please convey my renewed thanks to all those officials that were involved with the most praiseworthy organization of the event…. This event from some thirty-seven years ago is fresh in my mind, and I relieve it with immense joy, emotion as well as deep respect and love for Prince Amyn Mohamed, who has overseen the progress of the Ismaili Scouts and Guides as well as the activities of Bands and Orchestras all over the Ismaili world. Prince Amyn Mohamed has committed his life for the welfare of our greater Ismaili Community in particular and other communities around the world both through Jamati institutions and the aegis of the Aga Khan Development Network. His service as well as his dedication to Mawlana Hazar Imam and the Jamat is an example for every Ismaili to follow. I am sure every Ismaili Scout, past and present, will join me in saluting Prince Amyn Mohamed for his role as the Chief of Ismaili Scouts. Date posted: Saturday, January 12, 2013. Please Click on Contributors for a profile of Khizar Hayat. Mr. Bulchand L. Ramchandani (1931-1939) was a Wood Badge holder and a trained Scouter. He joined H.S.H. Prince Aly S. Khan Garden Scouts Troop in 1932. With his initiation the Troop’s set was reshuffled and he was appointed as the Scout Master. Under his able leadership and with his assistance, the scouts of this Troop took active interest in scouting and passed Tenderfoot, Second Class and other proficiency badges, and thus became trained Scouts. He was appointed the Hon: Organizer for all India Ismaili Scouts Association in February 1938 by the Ismaili Chief Scout, H.S.H. Prince Aly S. Khan. After the partition of India and Pakistan in 1947 Mr. Bulchand decided to settle in India. He was succeeded by Mr. Iqbal Qureshi as the Hon. Organizer in 1953. These photos and article took me back many years. I was born in Kharadhar and was Cub for longtime. I remember mostly all the gentlemen in these beautiful photos and the names in this nice article. They all gave their services to the community for their whole lives. May Hazar Imam bless the souls of those who are not with us now and give health to those who are still serving the community. Ameen. And many thanks Mr.Khizar Hayat for preserving these priceless photos. So much of the past history of the members of the Noorani family is not known, so articles such as this one tells us a lot of our history. Very good information. Thank you sir, very good historical article with old pictures. A very memorable and nice article. I was looking for Hussain Sir and Zulfikar Sir my scout masters from Darkhana Kharadar scouts, in picture. I still rememember my reef knot from scouting days. I convey my regards and Ya Ali Madad to them. I had a chance to meet Mr. Hayat recently in Orlando. You have shared with us a very memorable piece of historical information. Oh my god, this is amazing. the pictures are so beautiful. It was so wonderful seeing you with Prince Amyn. Its so incredible. I loved the article and my personal fav is sir baden-powells pic at the beginning. so beautiful and rare indeed. Nicely done. This article is a must for history buffs. Very informative and inspiring article. Have worked with Mr Hayat many years ago, and I would have expected nothing less. Thank you, sir, for a trip down the memory lane.